A Senate committee on Wednesday approved President Barack Obama’s nomination of John B. King Jr. to be education secretary. The 16-6 vote in the Senate Health, Education, Labor and Pensions Committee sent the nomination of the acting secretary to the full Senate. If confirmed, King would oversee the department as it puts in place a bipartisan education law passed by Congress and signed by Obama in December. The measure revamps the widely criticized No Child Left Behind Act and substantially limits the federal government's role in public schools. 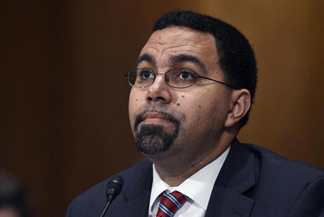 King, who began his education career as a high school social studies teacher, was tapped by Obama late last year to succeed longtime Education Secretary Arne Duncan, who stepped down in December. The committee chairman, Sen. Lamar Alexander, supported the nomination and said he hoped the full Senate would act quickly. Alexander, R-Tenn., said he did not think it was “good for our system of government to go through an entire year” with no one firmly in place to lead the department as it works with the states and local school districts to implement the new K-12 law. Sen. Elizabeth Warren, D-Mass., said before the vote that the department hasn’t done enough to protect student borrowers and take prompt action against for-profit schools such as Corinthian Colleges, which filed for bankruptcy protection last year amid fraud allegations. Warren said she would vote to approve King’s nomination in committee but that she would not support him in the full Senate until she gets more “direct answers” to her concerns. “I still have questions about how he plans to change the culture at the department,” she said.